Grand Lake holds a special place in my heart. Dad’s parents had a home there for most of my childhood, and my memories of summers spent there are…magical. We’re talking back steps framed by huge Dahlias, the smell of freshly turned garden soil, the taste of home grown…everything, and the glint of sunlight on the water as I studied my Grandpa Bill’s fishing skills and tried to whistle through my front teeth just like he did. Although my grandparents are gone now, Dad and his brothers and sisters rent a place there every summer. There’s lots of laughing, talking and my God the food…well, we like to eat. I’ll just say that much. I learned a lot on that lake growing up. My cousin taught me what firecrackers in an old metal coffee can sounded like; Dad taught me how to tell a really good scary story; and my Uncles showed me that sometimes it is better just to jump on in…even if the water is freezing. I caught my first fish on that lake; dropped an expensive fishing pole to the bottom of it; learned to dive off my dad’s shoulders; watched Grandma make noodles (I haven’t figured that one out yet), helped teach (and I use that term VERY loosely) my cousin how to swim; caught fireflies; tried to lean how to grow things (my sister is MUCH better at that than I am); watched my mother run from a raccoon; and we laughed…a lot. For me Grand Lake is filled with happy memories and love, and I wouldn’t have it any other way. We’re making new memories on the lake now, and Spider-Man-like leaps, fish kisses, and my first experience with home-brewed whiskey are just a few (the whiskey was great…the morning after, not so much). My sister’s strawberry preserves and homemade pickles are showstoppers, a new generation is learning how to fish, and we’re still laughing. Fortunately, some things never change. 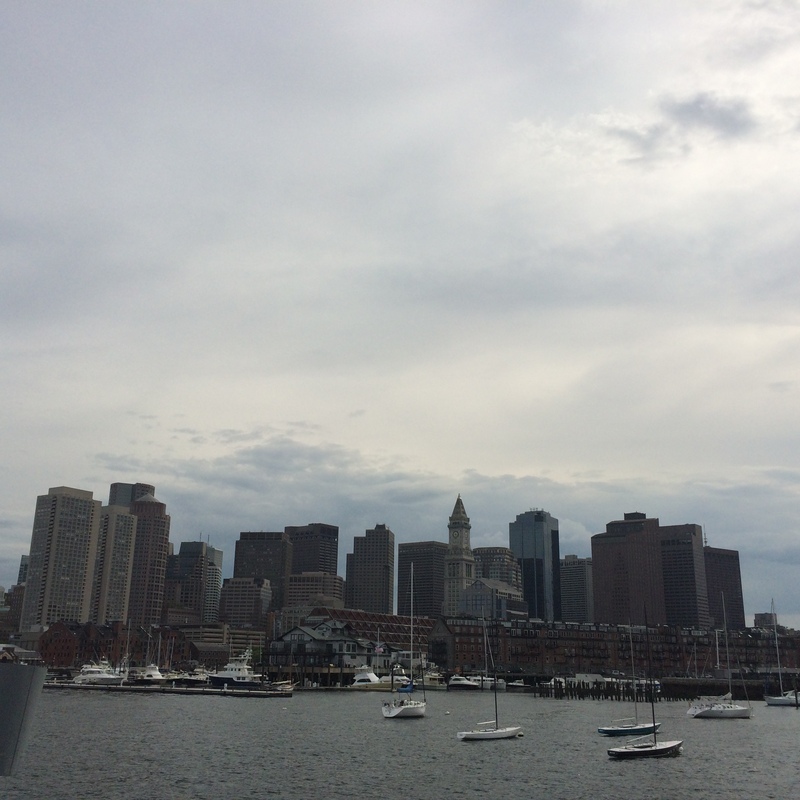 Boston: Part Five – Food! 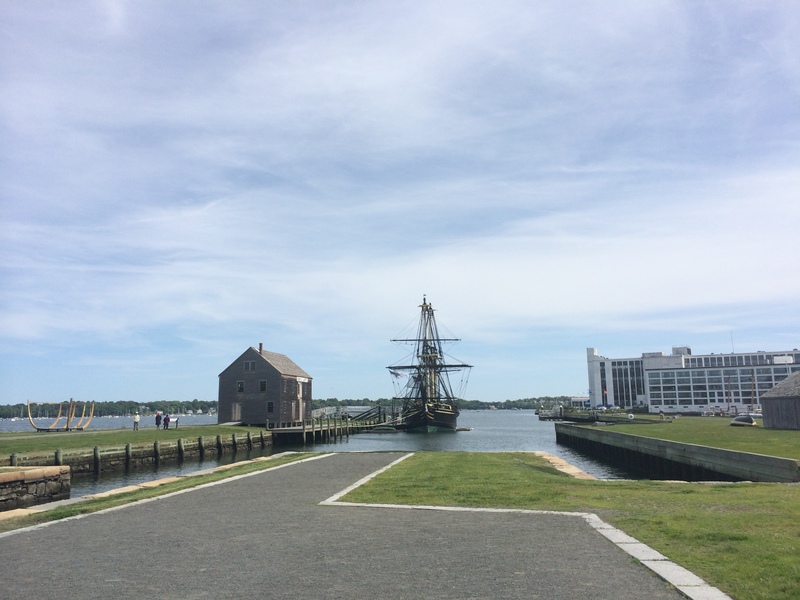 Okay, so maybe this is a bit extreme, but in addition to the NE Aquarium, Freedom Trail, Salem, Fenway, and Sam Adams Brewery I had to tell you about the food (and beer). One of the great experiences of any vacation is trying out the local cuisine. Coming from a landlocked state, I jump at any chance for fresh seafood, but all the food was excellent. We started every morning at City Feed in Jamaica Plain (well, except for a morning we went to Whole Food to pick up some groceries). Most days we just got coffee or tea, but the first morning I got a prosciutto scone. I’d never really eaten savory scones before, but this is something I’m definitely going to have to try. On the recommendation of our host, we also checked out Strega in Boston’s North End. I had the most amazing dish of pasta with scallops, shrimp, spinach and their strega sauce. Oh my gosh…delicious. I still feel bad that my friend has a mild allergy to shell-fish, so she could only eat a bite of mine. She said her pasta with eggplant was good, but not nearly as good as my pasta. The history of the establishment is not as impressive as its food, and that’s saying something. Our first visit, I had baked haddock filled with seafood stuffing, roasted potatoes and asparagus. Now, anyone who knows me will attest to the fact that I consider potatoes to be their own, essential, food group. The fish was so tender and flavorful, that I skipped the potatoes in order to be able to eat more fish…yep, that good. Our second visit, I had lobster ravioli. Succulent, creamy and delicious…I didn’t bother ordering any sides or even a salad. One of the first things a friend of mine, a Boston native, told me was that I needed to get Monkfish Marsala at The Daily Catch. The North End location is tiny, and seats maybe 15 people total. At first, I thought we weren’t going to be able to get in. Every time we walked by their location there was a line down the street. However, we managed to get there during the week for an early lunch, and there were two seats left. Now I’ve never had monkfish before, but I swear the next time I had lunch with the friend who recommended it, all I could think about was that tender fish and savory/sweet sauce. How am I supposed to go back to eating frozen seafood after this? We couldn’t escape the North End without trying a couple of the Italian bakeries there. Bova’s was first on our list. Their eclairs and Boston Cream pie were as beautiful to look at as they were to eat. A mad dash through the pouring rain didn’t even deter us from trying their pastry. We also got a mini-cannoli to share. That bite convinced me, I was going to need to explore further. My favorite may have been Modern Pastry. This is where I really got my first cannoli, and tried macaroons for the first time too. You pick out your shell, filling and toppings and they make it for you right there. I chose a crisp shell, dipped in chocolate with a traditional ricotta filling. I’m going on a hunt for cannoli in Tulsa, but I’m afraid I’ve been spoiled. Before trying the cannoli in Boston, I thought they were kind of like a cream horn that are readily available in bakeries here. I’ve never been so wrong. Instead of the overwhelming sweetness I was expecting, these were creamy but not quite as rich as a cream cheese filling and barely sweet at all. They have a great balance between that crisp shell, light creamy filling, and dusted with powdered sugar for the perfect amount of sweetness. (now I’m hungry). I can’t leave out the taverns. We stopped for a beer at the Green Dragon, which was established in 1654. 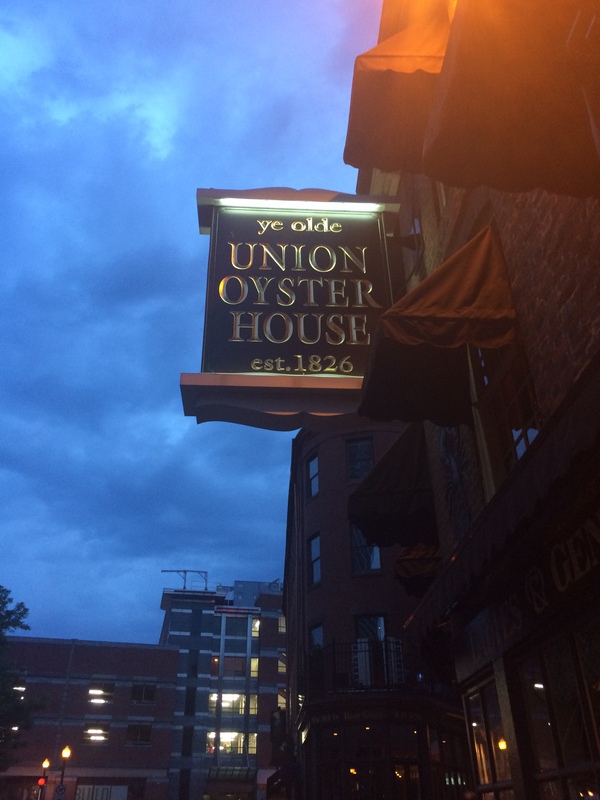 Paul Revere, John Hancock, and Daniel Webster were all frequent customers. John Hancock’s brother actually lived next door. The plans for the invasion of Lexington and Concorde were overheard here, so this is really the beginning of Revere’s historic ride. It gives me goosebumps every time I think about it. Paul Revere and John Hancock discussed the ride in the same tavern I enjoyed a Sam Adams Summer Ale. We also stopped at Bell in Hand, which boasts its status as the oldest tavern in America. It was built in 1795. When we dropped it there, it wasn’t what we expected. It was more dance club than tavern, with flashing lights, loud music, and a plethora of twenty-somethings crowding up to the bar. It reminded me of college. We didn’t stay long, but we did have a beer there. 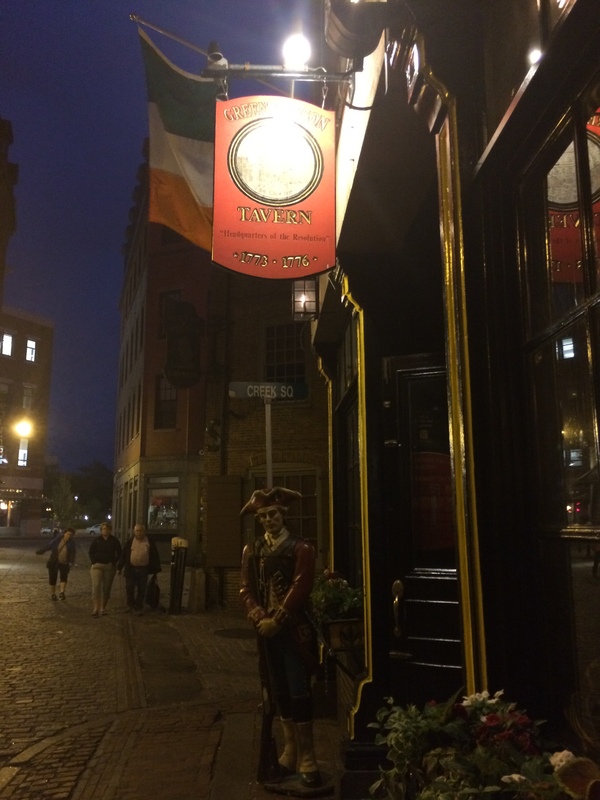 Of course, this being Boston, there was no shortage of Irish Pubs to be found. Our first evening in town we stopped off at The Black Rose for a pint or two before heading back to the condo. Like most Irish pubs, it didn’t disappoint, dim but warm atmosphere, a good bartender, and a group of drunken revelers made for an entertaining evening. P.S. I discovered when we got home, that Benedict Cumberbatch arrived in Boston the week after we left…he also enjoyed cannoli at Modern Pastry. Really? A week after I left? Well, Benedict, I hope you enjoy Boston as much as I did! Catch part one, part two, and part three too. My best friend received tickets to see the Red Sox play in Fenway along with dinner at Strega for her birthday gift (okay, so maybe it was a bit of a gift to myself too). The day of the game dawned cold and rainy. Now when I say cold, I mean frigid, especially for the end of May. The high never made it out of the 50’s and the rain made things just that much more dreary. Before we ever made it to the game, we toured the Sam Adams Brewery (free beer before the exorbitant prices of concessions at the ball park? Of course!). I’ve toured my fair share of breweries, and this definitely wins first prize for entertaining tour guides and fun atmosphere. The Boston location is their R & D facility. This is also where they brew Utopia. What’s Utopia? This is their 27% alcohol, limited release beer that I’d never heard of. They only sell the concoction on odd number years, and only release between 1,500 and 2,000 bottles with the price per bottle averaging between $150 and $200. Utopia actually won a cognac taste contest…well, it did until they revealed it was actually a beer. Then they took their prize away. Every tasty thing starts with ingredients, and that’s where the tour began as well. Allowing each person to taste the different roasts of barley (my favorite was the caramel roast, but as much as I enjoy a good dark beer, I wasn’t thrilled with the dark roasted barley. It just tasted burnt.) and rubbing hops between our hands to release the aroma was fun and interesting. 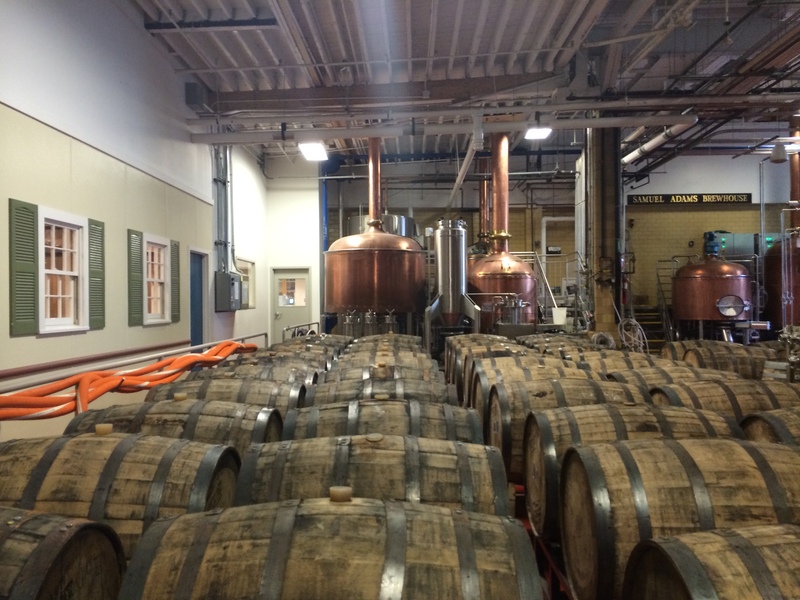 I’d never really given too much thought to the ingredients of beer before, and after this part of the tour, a little idea got put in the back of my mind…it would be kind of fun to brew my own beer. Unsurprisingly, my favorite part of the tour was the tasting. We tried three different brews. The Boston Larger, Summer Ale and a new one that is in development. So new, in fact, it doesn’t have a name. Of course it doesn’t. It was my favorite. All week, I’d been drinking Sam Adams Brick Red, an Irish Red sold only in Boston and Sam Adams Summer Ale (very different, but both delicious). I really enjoyed the explanation of the difference in brewing techniques, clarity in different varieties, and thinking about the actual flavors revealed with each taste. The new beer, referred to as extra special bitters, contains a couple of varieties of English hops and has a great crisp flavor. If you hear about any Sam Adams beers being released that sound a bit like this, let me know. All good tours end in the gift shop, and this is where our Sam Adams brewery tour ended as well. We were free to peruse the shop with the remnants of our last beer from the tasting (mine was long gone). I was getting a bit nervous about the cold weather predicted for the game, so I was on a hunt for warm…stuff. We’d started the day with a bit of shopping at Faneuil Hall and Quincy Markets. If we were going to go to the game tonight (predicted to be 45 degrees and raining), I was going to need something warmer than anything I packed. Fortunately, I found a hoodie and we both got some gloves. Sam Adams Brewery also supplied a long-sleeved t-shirt from their gift shop. I should have joined my friend in purchasing a beanie, but I foolishly thought the hood would be enough. Our seats were in the right field bleachers, and pretty great. 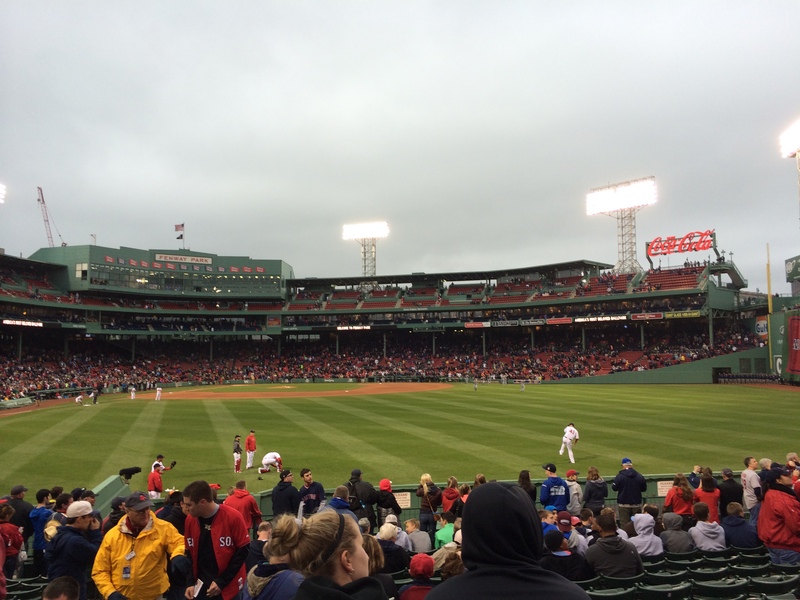 The Red Sox beat the pants off the Braves, but that didn’t detract from my enjoyment at all. There have probably been baseball games in which I paid less attention. I can’t remember them though. There was a lot of texting happening to keep my mind off of the cold. A lot of laughing with my friend, and getting to know the couple sitting behind us. This was the evening that convinced me that I wasn’t as keen to move to Boston as I thought. It was the end of May. This weather was just wrong. We had a great evening, and lasted until the top of the 9th before we gave up and went back to warm up. Fenway is an exciting place. In spite of the weather there was a good crowd in attendance, but that may have been due to the fact they were celebrating the 10th anniversary of their 2004 World Series win. Members of the 2004 team were brought back to make an appearance, and the mood was pretty festive. My parents were in (warm) Oklahoma watching the game on television, and watching for us. By the time our section made national television, we were out of there. I wouldn’t have traded it for anything though. 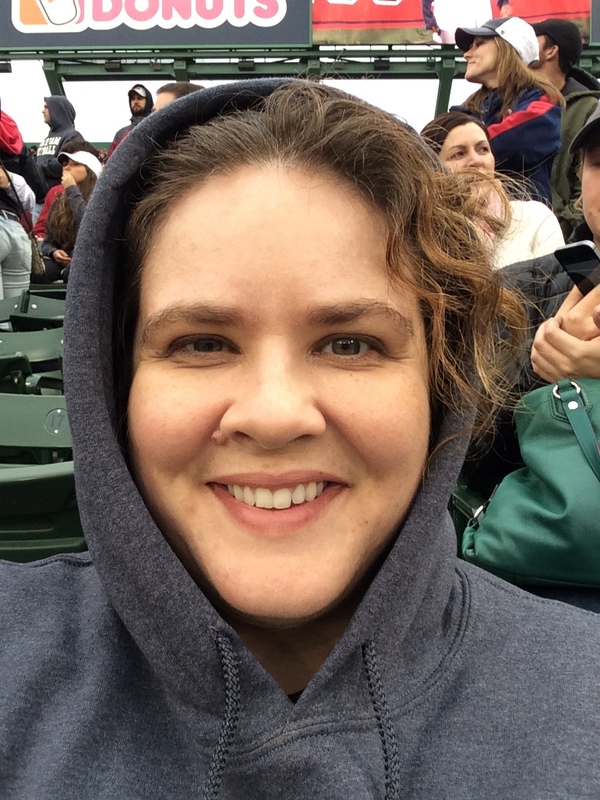 It was a fun night (even if I slept in the hoodie because I couldn’t get warm). What’s the coldest event you’ve ever attended? Also, anybody out there brew your own beer? How’d it turn out? Is it worth a try? You can catch up with part one and part two, if you missed them. 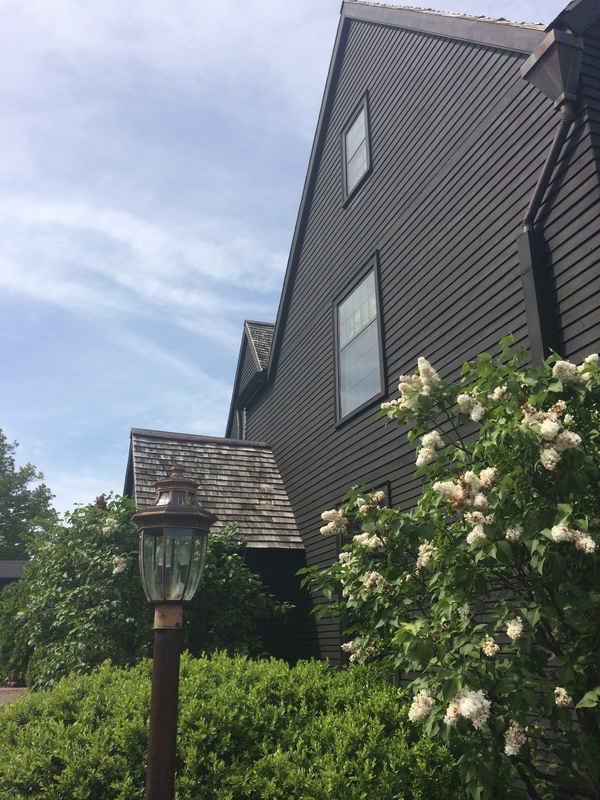 During our stay, we took a day trip out to Salem to see the location of the infamous Salem Witch Trials. The town has more little museums, occult themed gift stores and store fronts for psychics than any place I’ve been outside of a Renaissance Fair. It makes for a very cool, slightly spooky place. The town itself is gorgeous with beautiful architecture, well maintained gardens, tasty restaurants and a beautiful view of the ocean, but I also got the feeling that I didn’t want to be there after dark. I’m sure this has more to do with my runaway imagination than anything else, but I’m grateful we had a sunny day for our visit. Hopping on the train with no real plan in mind, we made the short journey. When I say no real plan, I’m completely serious. We knew there was a museum or two we wanted to visit, but other than that…we made things up as we went. We thought that the red lines painted on the sidewalks would be incredibly helpful. In Boston they have a red brick line embedded in the sidewalks to guide tourists through a walk on the Freedom Trail, so this is the same thing right? Nope. Close though. The red lines all led to a tourist attraction, but there isn’t a real trail. It branches off and goes in different directions, and following the red lines didn’t lead us where we thought they would. There were just too many things to see. The first museum we visited was the Salem Witch Museum, and surprisingly it was more performance than typical museum. Everyone starts the tour sitting in a darkened room with an illuminated red pentagram emblem in the floor and wax figures or mannequins in life-sized shadow boxes on the upper level surrounding the viewing area. As the story of the Salem Witch Trials unfolds individual shadow boxes light up. Of course, the whole thing begins with a figure of the devil and the only light is his red eyes. It was creepy but fun. Not quite haunted house scary, but creepy. (otherwise, my bestie would never have gone in with me. There may have been an “incident” in which I threw pushed her into a wall when a werewolf in a haunted house ran toward me much more quickly than I expected. That ended her willingness to allow me to participate in these events with her.) The tour ended with another tour guide explaining the exhibits and proven facts of the time period. What really impressed me was the tail end. They explained a bit about Wicca, which really set the actual religion apart from what these 17th Century people had been persecuted for. Of course, I’m a fan of anything that advocates tolerance for people’s’ differences. 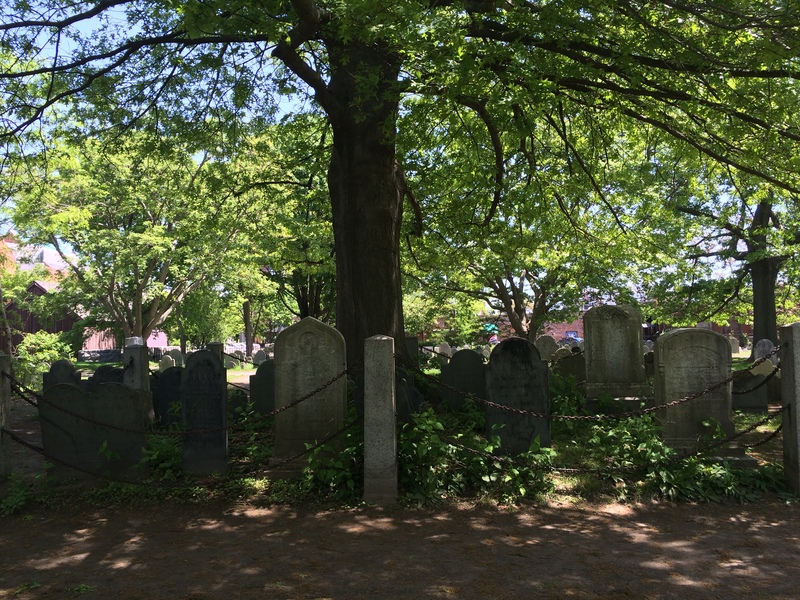 Before we actually embarked on our museum tour, we explored some other sites in town, including an old cemetery. A cemetery in which my best friend abandoned me (although she swears that is not the case). Victims of the trials are laid to rest in this cemetery along with others from the same period. My short time in that place felt eerie, even in the bright sunlight. 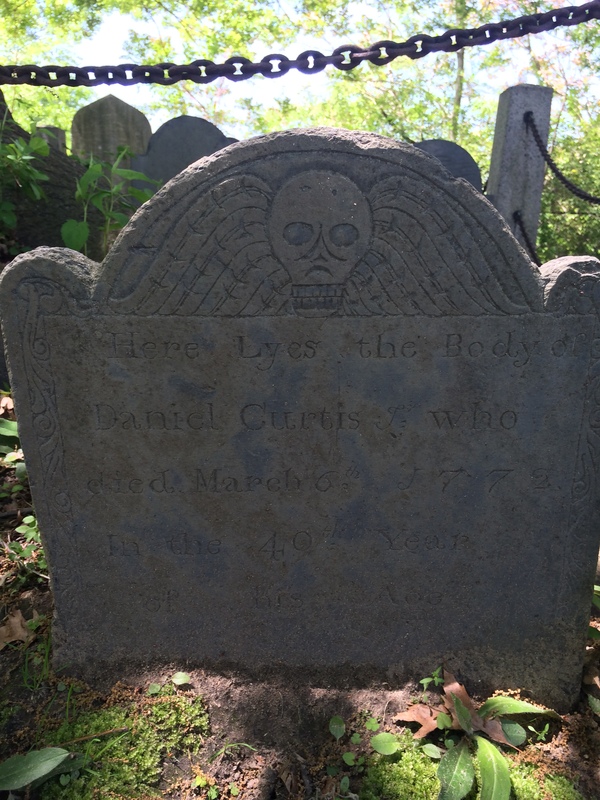 I explored tombstones from another era, and scared…myself. My friend told me she was going to go look at a sign featured at another entrance to the cemetery. This didn’t worry me because it was only a dozen yards away and there was a tour group that arrived the same time we did. However, a few minutes later, I looked over and no friend, so I looked for the tour group (about 15 people) and I couldn’t see any of them. Not. A. Single. Person. I may have possibly been worried for a moment that the dead witches took them all. (It was only for a second though!) As I slowly turned in a circle, searching for any human being (who wasn’t dead and buried), I got a little nervous, but by the time I made it back around to the last place I’d seen the tour group, they were actually there. My friend however, was not. Possibly, it was a coincidence that my particular location meant that when I looked the first time, all 16 people were hidden from view by trees, signs or tombstones…we’re totally going with that. A minute or two later, I got a text from my friend who was waiting at a church six blocks away. A fascinating aspect of the cemetery (other than the spooky abandonment) were the style of the tombstones themselves. Many of them depicted a skull surrounded by wings. Although, this is just my personal theory, I’m guessing the carving isn’t meant to be spooky, but more to depict the flight of a soul to heaven. That’s my theory and I’m sticking to it. I can’t imagine why my friend didn’t want to stick around this place? The house is just as interesting as the novel makes it sound. Filled with secret passages and beautiful views, I thoroughly enjoyed my tour. The home was actually owned by Hawthorn’s cousin who inherited it after her father and brother were lost at sea. She also inherited all of her family’s business holdings and never married. It is assumed she didn’t want to be forced to turn over control of the business to her husband. Probably a smart move considering her family came into possession of the property because the original owner lost all of his money in a poor investment. The house began with seven gables, but it was reduced to four (no one knows why) before Nathaniel Hawthorn ever visited. The description of the house comes solely from his cousin who he spent a lot of time talking with. Many people assumed he lived there, but he never did. The house has been faithfully maintained and restored down to the paint colors. My favorite part was the secret passage though. (How could it not be? How often do you get to explore a secret passage?) The passage opens in a false wood cupboard and goes up into the attic. It is curvy and tight, but so very cool. From the window there you can look out over the ocean. I’m still a bit in awe of the fact that I got to walk through the same secret passage as Nathaniel Hawthorn…so very cool. They have also moved Hawthorn’s birthplace to Salem. I’m always fascinated by exploring the way people before us lived, and while we weren’t permitted to take pictures inside, the grounds and view are beautiful here. On my walk to the House of the Seven Gables, I came across another three-masted ship, the Salem Friendship. I didn’t have time to explore the vessel, but I did snap a picture. Due to my inordinately bad sense of direction on this trip, and a bit of a time crunch (neither one of us wanted to stick around after dark) I just moved on my way to my destination. 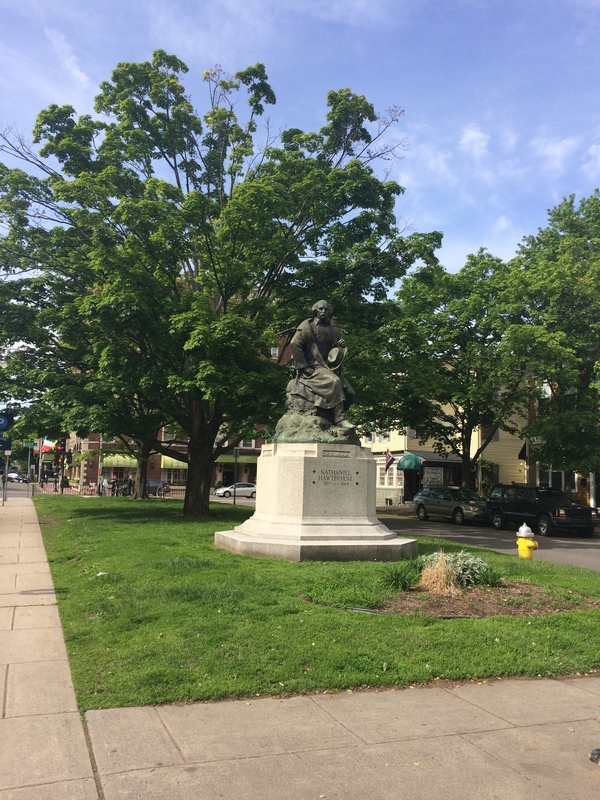 On the way back, I discovered I’d spent too much time exploring the gardens and an unguided trip through Hawthorn’s birthplace to do much other exploring as I met up with my friend to take the train back in to Boston. P.S. Up next Fenway Park! 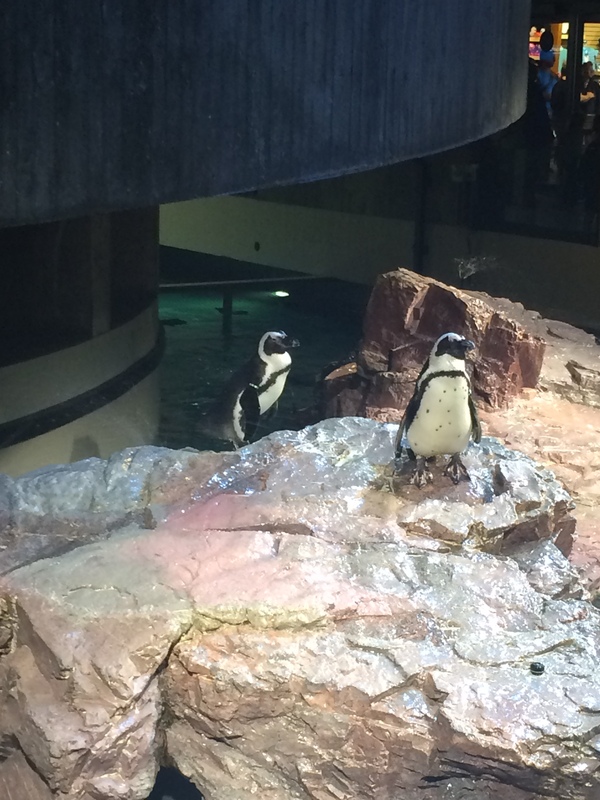 Just in case you missed it, Boston: Part One – The New England Aquarium can be read here! One of my favorite things about Boston is the history. Seriously, I loved Washington, DC. The nation’s capital contains so much of what makes the United States, but Boston is really where it all started. When politicians on both sides really start to hack me off, I think about Boston and the men who conspired for a revolution to create a society and government that, in some ways, little resembles what we have more than 200 years later…but, I digress. No soapboxes, I promise (okay, probably soapboxes, but I’ll keep them as short as I can). Old North Church, the location of the lanterns used to signal that the Regulars were coming (as one helpful guide pointed out, technically everyone was British, so “the British are coming” wouldn’t have made much sense. The things we never really think about…) held a hushed reverence even with all the tourists. The church now holds a commemorative lamp that is always lit in remembrance of the two lanterns hung to signal the British attack. Did you know that church members purchased pews, and decorated them as they saw fit? The placards with the family names still adorn the individual pews, and they’ve preserved the decoration of several as well. Paul Revere’s house was an interesting tour. With beautiful leaded glass windows, it was a wonderful insight into the life of a man so…admired (see, I didn’t say revered) for his role in the Sons of Liberty and the foundation of the United States. My dad must have asked me three or four times what the name of Paul Revere’s horse was for that midnight ride…I found him a book titled What’s the Name of Paul Revere’s Horse? (Short answer, it wasn’t his horse, so we don’t really know.) However, before finding the book, I read up on every bit of history about the Revere family, in hopes that a horse would at least be mentioned. Nope, not there. 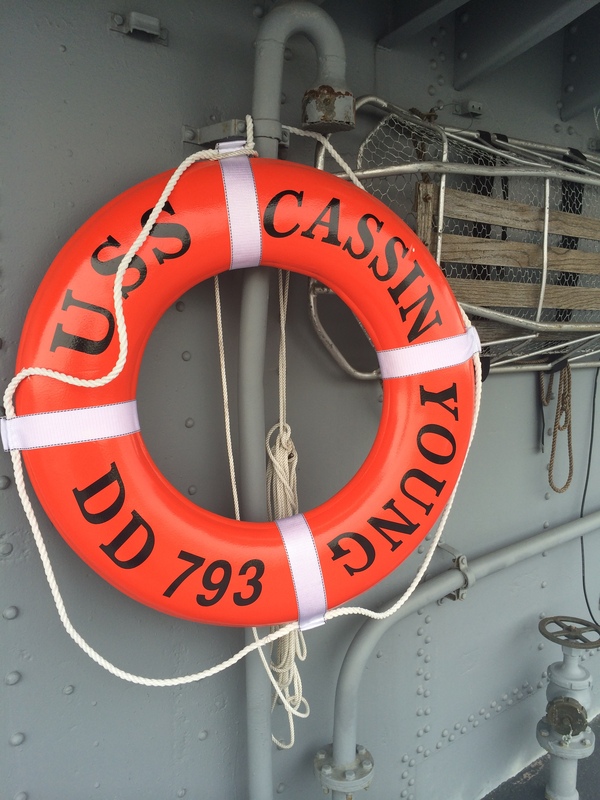 One of the best parts of the trip, for me, was visiting the oldest active warship in the United States, the U.S.S. Constitution. 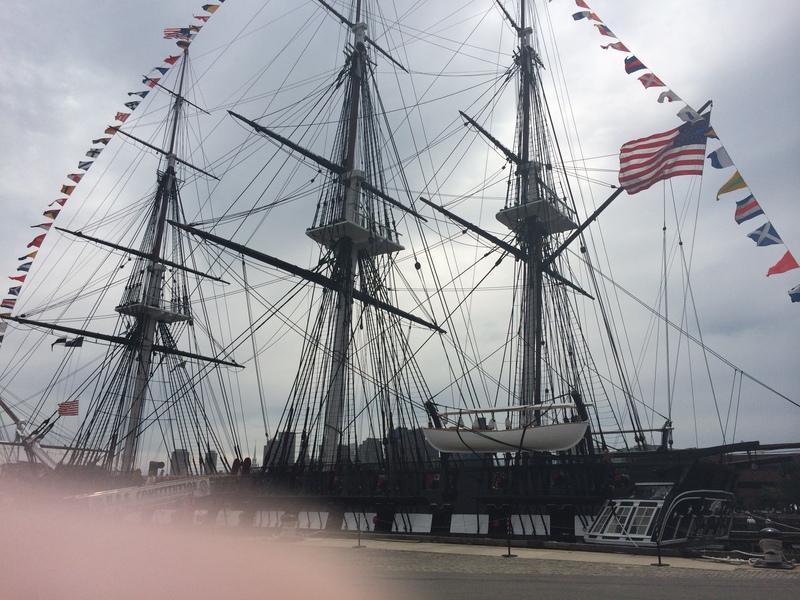 A three-masted ship, who maintains her active status by being towed into Boston Harbor (1 KM) every July 4th to give a 21 gun salute to all fallen military personnel. Don’t ask my how my best picture of this magnificent ship contains the blur of my finger…I don’t know. I really don’t know. From there I headed over to the U.S.S. Cassin Young, a World War II battleship. Since this is not an active vessel, park rangers, instead of Navy personnel, are available to answer questions. The first thing I see as I head up the gangplank is a sign that states that “this vessel has not been renovated for the safety of visitors”. What does that even mean? 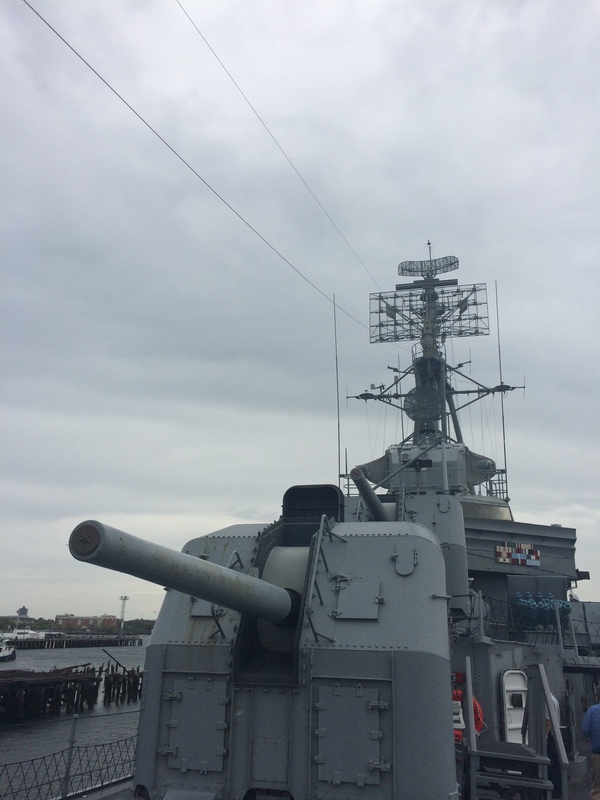 As the drizzle began to fall, I wove in and out of sick bay and communications centers, (without tripping, I might add) and gazing in fascination at the guns (are you sensing a theme here? Hmm…). However, I didn’t stay long since the drizzle was making the deck slippery and “this vessel has not been renovated for the safety of visitors”. 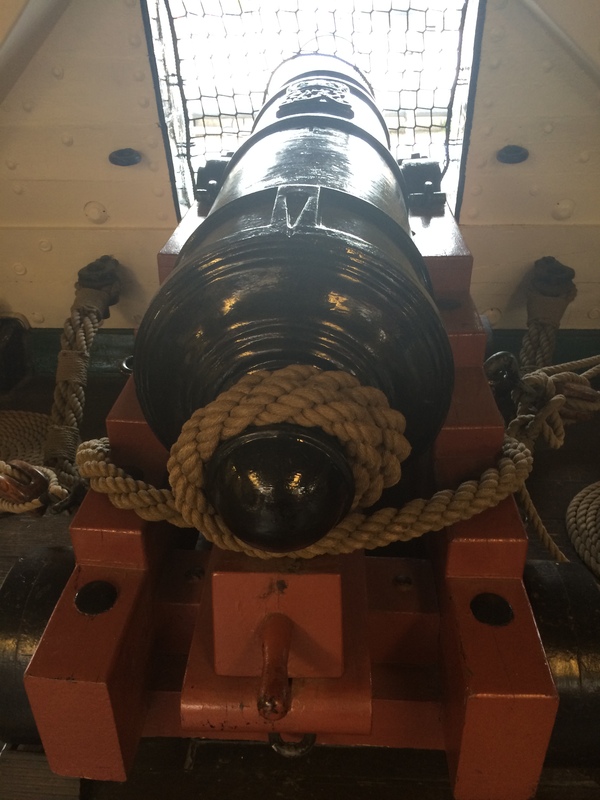 Did you know the Battle of Bunker Hill wasn’t fought on Bunker Hill? The colonial troops accidentally needed up on Breeds Hill instead, and the battle was fought there. 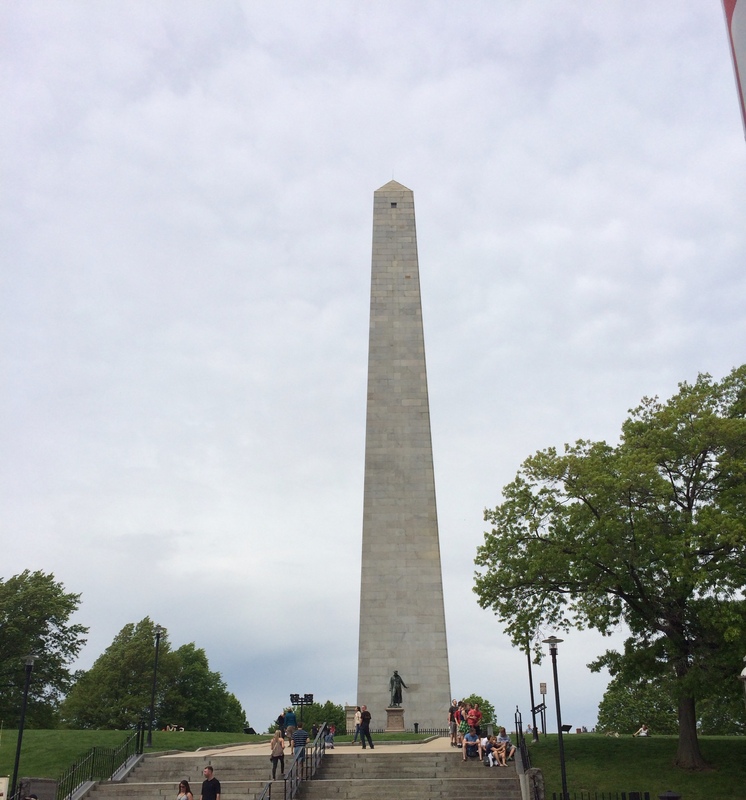 The quote, “don’t fire until you see the whites of their eyes” comes from this epic battle that the colonial troops actually lost, but so many of the British regulars were brought down during the fighting that it was commemorated with the Bunker Hill Monument. This actually brings me to my next example of quirky Boston facts. The Boston Massacre began with a 13-year-old boy in front of the Old State House, and having a 13-year-old nephew…I’m not shocked. There is a medallion to commemorate the location set into the paving stones in front of the Old State House for an event that actually occurred across the street in front of what is now a Bank of America. Is it just me or does it seem like there’s a problem with sense of direction happening here? I know I’m bad with directions (no less than three times did I leave a historic location and turn the wrong direction), but I am not in charge of battles or the location for monuments…yet. 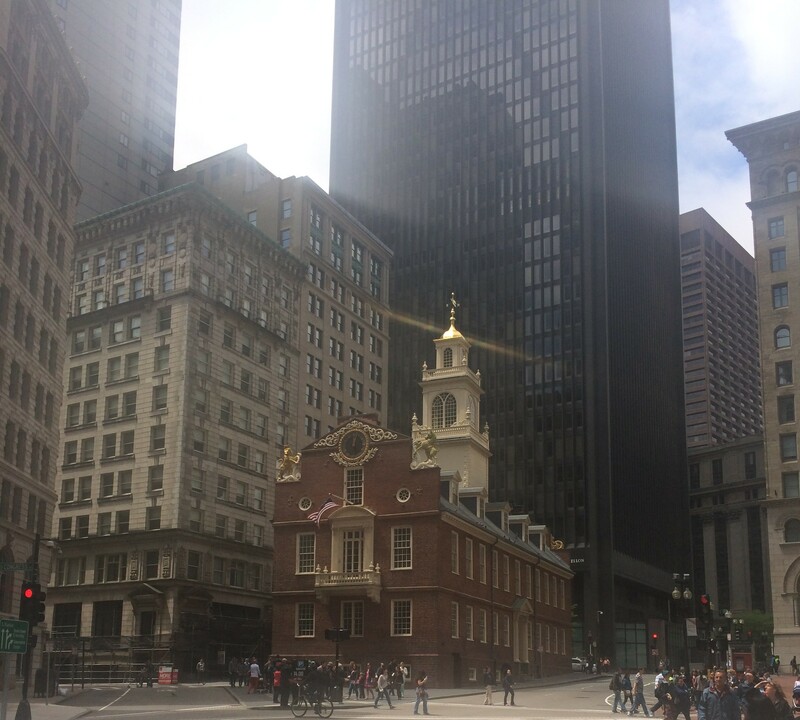 😉 Actually, I highly recommend the tour of the Old State House and the talk on the Boston Massacre. This is truly fascinating stuff for the history geek. 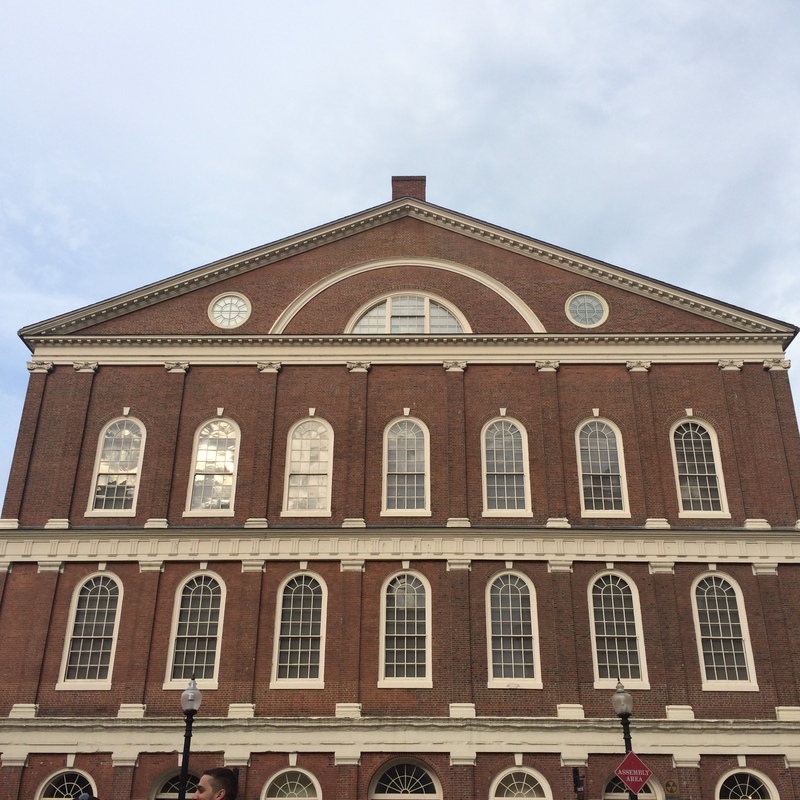 Faneuil Hall hosted the trials of the British soldiers who killed Bostonians during the Boston Massacre. John Adams served as the attorney for the defense of one of the accused and another lawyer (who is stupidly famous, but I forgot his name) also served as the attorney for the defense against his brother, the prosecutor. In actuality all but two of the soldiers were acquitted in the case. The convicted solders received sentences for manslaughter. Boston Commons and the Public Gardens were a balm after all the city streets we’d meandered through (although, Boston has remarkable green space and beautiful trees). Boston Commons is a big green area in the middle of the city that historically was used to billet British troops, graze cattle, etc. Incidentally, the troops sent for peacekeeping purposes (Ha! 4,000 troops to keep peace in a city of 16,000 people, half of which were women and children?) were suppose to camp in Boston Commons. However, it was November and they would have frozen to death. That’s why colonial citizens were forced to house them in their homes. 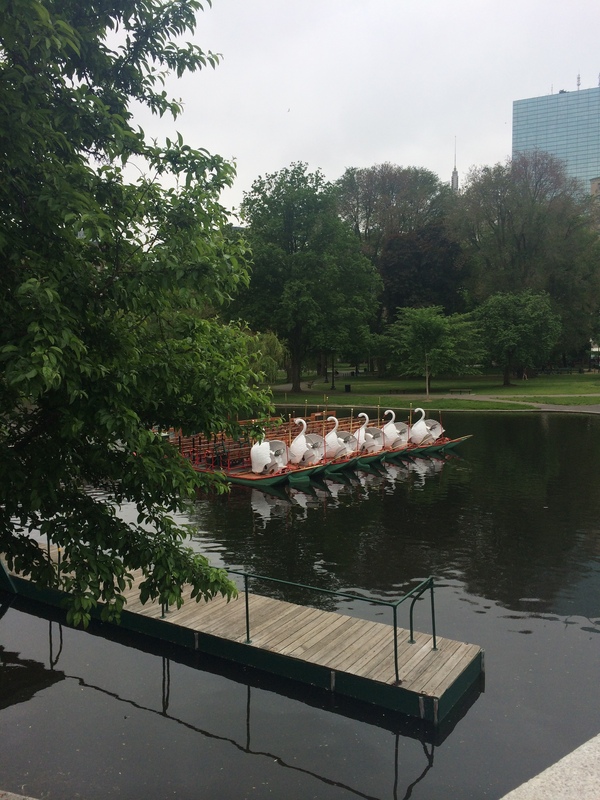 Just across from Boston Commons are the Public Gardens. This area is just gorgeous. Lush and green with ponds, flowers, and trees. This is also home to the world’s smallest suspension bridge (which I walked across) and the famous swan boats. I like trees, and bridges. On a side note, during our stay in Boston we came across no less than two weddings and got to watch while they took pictures (well, I say “watched”, more like patiently(ish) waited for them to finish). 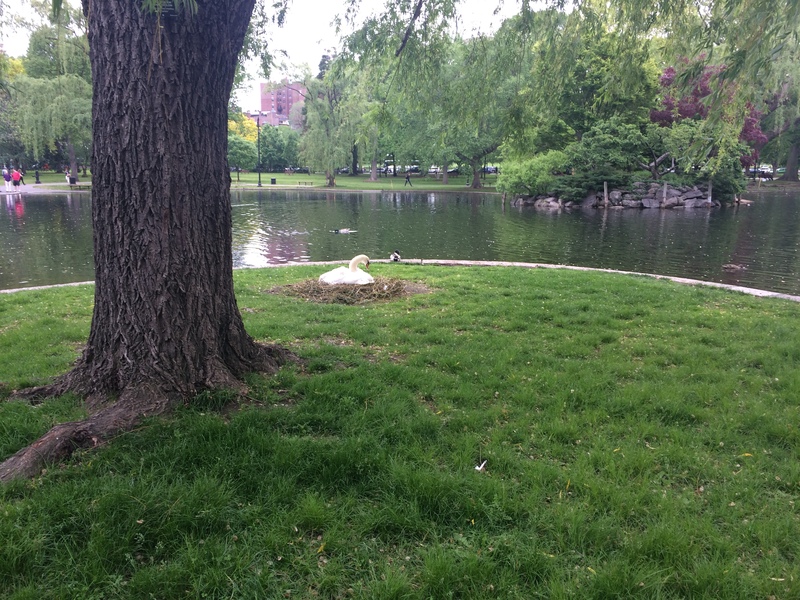 During our trek through the gardens we came across the tadpole pool, an actual swan’s nest (complete with nesting swans), and the bronze ducklings. 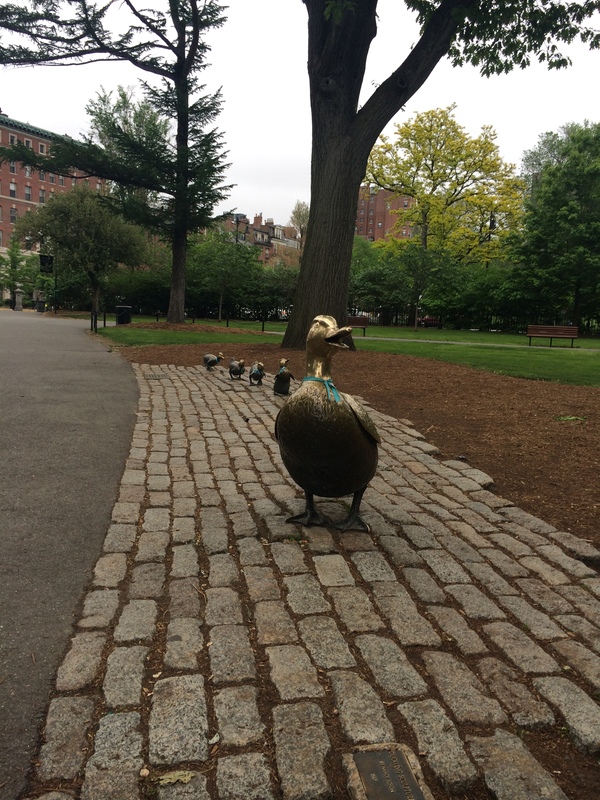 The ducklings are in honor of, Boston author, Robert McCloskey’s children’s book Make Way for Ducklings published in 1941. Every year, the ducklings are dressed up for Mother’s Day, a parade is held and families come out to have their picture taken with the ducklings. If you look closely, you can still see the blue bows around their necks. 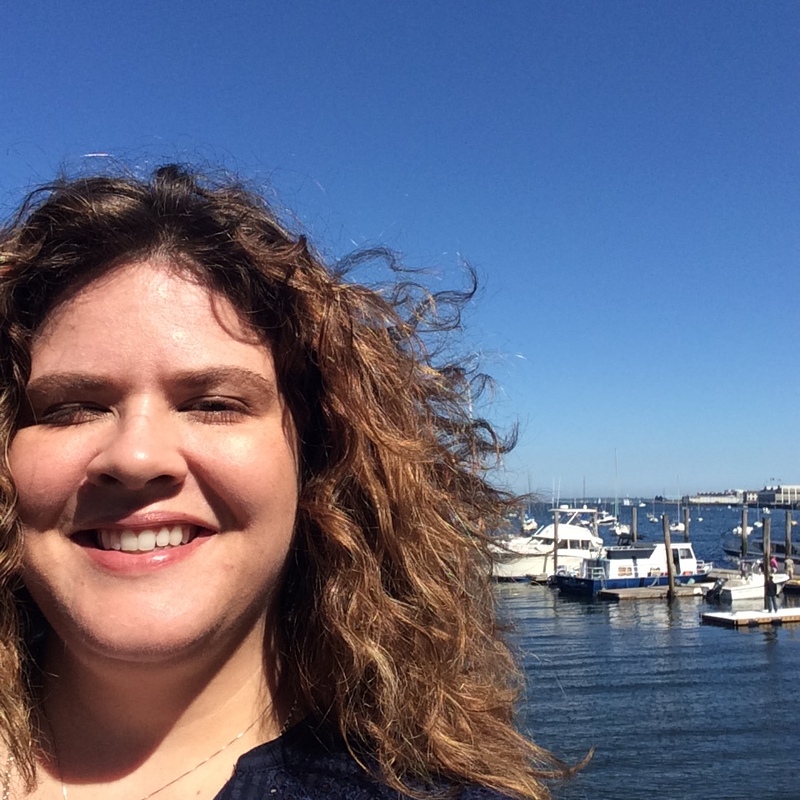 My Boston trip doesn’t fit into one post…plus, as my best friend will attest, I may be a little camera-happy on vacations. What can I say? I want to remember stuff! For this trip, we rented a condo for the week instead of choosing a hotel. I have to say, I don’t plan on doing anything else on vacations from now until eternity. It was perfect. We arrived in Boston pretty late, so between the darkness and the rain, I wasn’t able to get a really good look at the city or the neighborhood we would call home for the week. However, the space we’d rented exceeded all my expectations. The Victorian was filled with fresh flowers, and felt like coming home. It didn’t hurt that the bed was one of the most comfortable, and I slept better than I had in months. Our first day in Boston was crisp and sunny with barely a cloud in the sky…in other words – perfect, and although the forecast called for rain that day, none arrived (I cannot say that for the rest of the week). On our host’s recommendation, we checked out a great shop for breakfast. The little shop filled with organic food, and the beautiful aroma of coffee perfectly suited our needs for the morning. A chai latte and prosciutto scone later, I sat outside to enjoy the sunshine and watch the “neighbors” walk by. This is a cozy little neighborhood. Cars stopped to talk with acquaintances, people out walking their dogs smiled and said hello, and apparently everyone is a master gardener (or they just don’t have my black thumb). After breakfast we headed out to see the New England Aquarium, and see an IMAX 3D movie on the South Pacific. I did promise not to sing show tunes to my best friend (musicals are not really her thing…except she loves The Little Mermaid is Disney an exception? I’ll have to ask.) It was hard, but I managed to sing “I’m gonna wash that man right out of my hair” only in my head. I’m pretty sure she caught on though. I would love to pick out my favorite part for you, but there were a lot…a lot. The penguins ranked right near the top. They are so adorable, waddling around jumping up and down the rocks in their enclosure. So awkward on land, but amazingly graceful in the water. The waddle-waddle hop action just cracked me up. 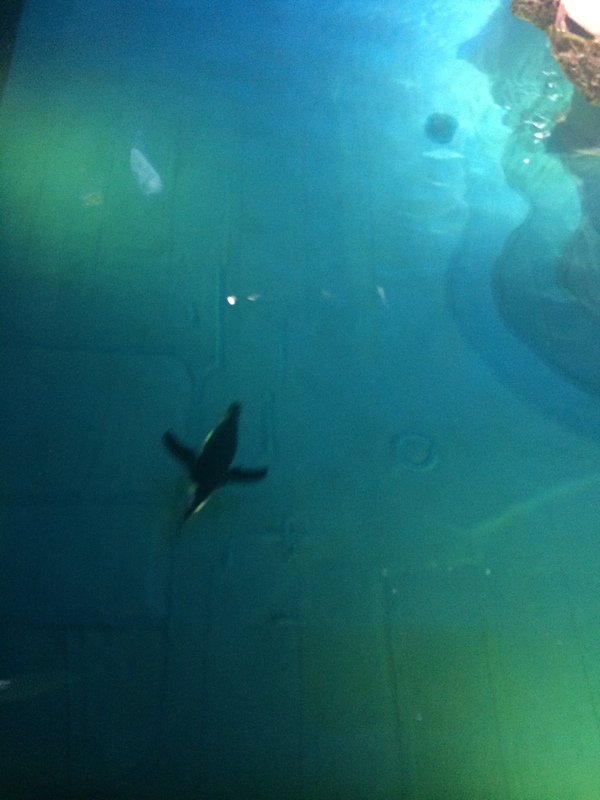 I could have stayed to watch them for at least an hour, however the NE Aquarium is a big place! The seals were up next, and they gave us a good laugh as two youngsters wrestled and pushed each other into the water. 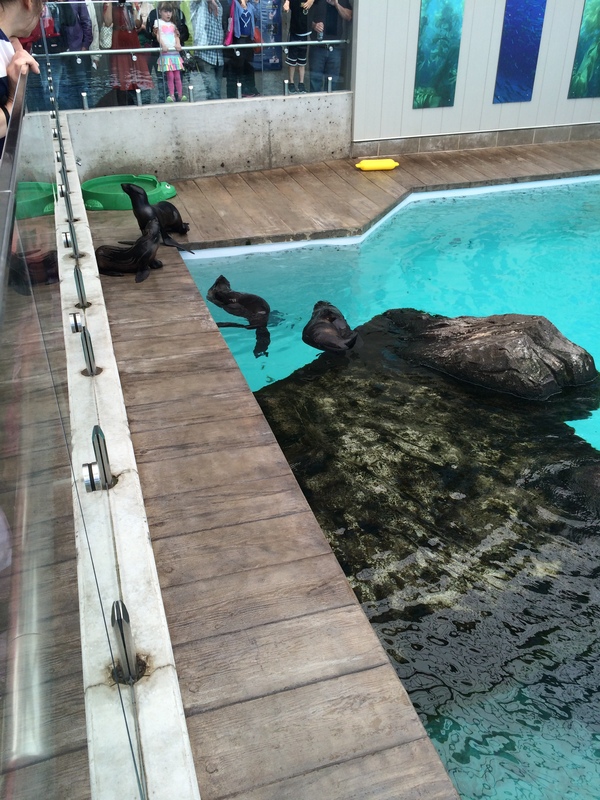 They reminded me of a couple of kids…or well…possibly…me…That’s when I saw the big daddy, walrus! This gigantic dude sat there and stared at a door like someone was late for feeding time before lumbering up the stairs to watch the crowds. As soon as he realized he was getting some attention, he slowly slouched down no one could see his face (like we’d forget he was there). From there we moved on to an astounding variety of sea creatures and exhibits. One of the best things (other than seals, penguins and walrus, oh my!) is the giant aquarium that shoots through the center of the building. The ramp winds up to the third floor, giving guests an opportunity to watch more than 3,000 species in the habitat. 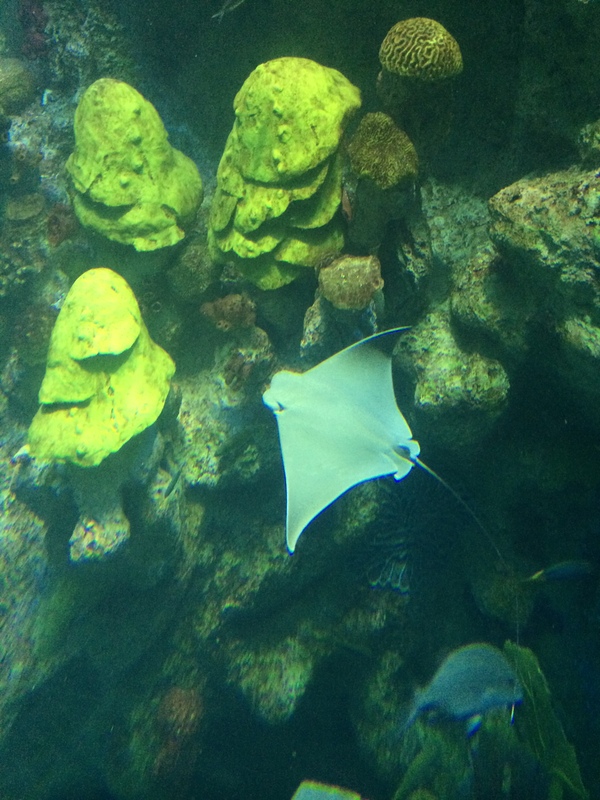 Rays, sharks, tangs, sea turtles…all kinds of amazingness! 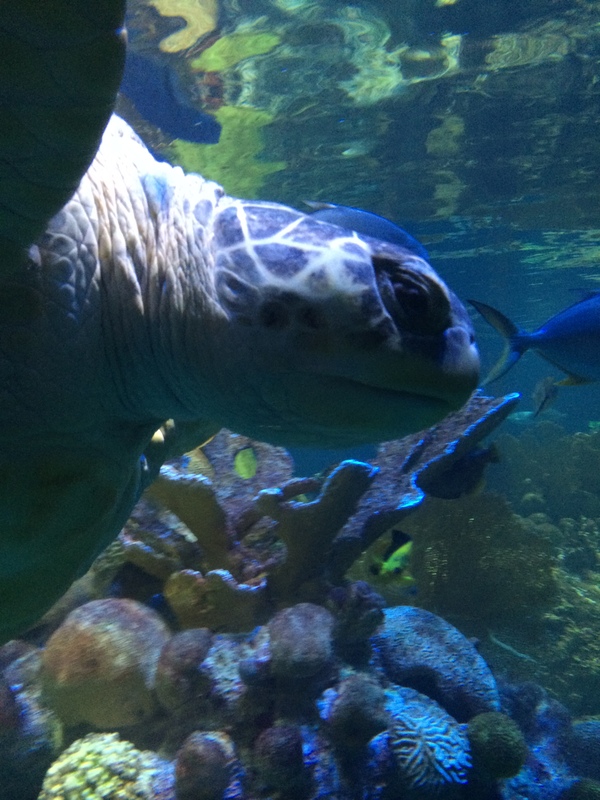 Myrtle, the sea turtle, is gigantic, and, according to staff, believes herself the star of the show here. She’s really not wrong. The slow-moving turtles gave a wonderful show, following guests both at the top of the habitat and down through the lower levels, looking like they were posing for photo-ops. I have a soft spot for rays. They were my first in-person encounter with ocean living creatures, and I even got to feed one when I was a kid. That’s when they hooked me, and I really loved watching the rays fly through the water, flapping their fins like wings and darting in and out of the other fish. After exploring the marine life to our hearts’ content (and the detriment of my feet), we headed to the IMAX, and after making thoroughly certain we were not going to see the 3D shark movie, settled in to watch the beautiful reefs in the South Pacific. After the movie ended, we wandered around the wharf. Coming from a landlocked state like Oklahoma, any chance to see the ocean is a thrill! Eventually we settled in for a snack and a glass of wine before trying to decide our next steps. The breeze coming in off the water was a little cool, but then again most things feel a little cool when you’ve come from temps in the 90’s. Just the colors of the sky bleeding into the darker blue of the water dotted with sailboats…maybe I need to move to the coast? Last weekend, I joined my family at Grand Lake for our annual long weekend at the lake. Every year we rent a house at Candlywyck Cove Resort (and a hotel room or two) and spend the weekend laughing, eating, swimming, fishing and playing dominos (and any other games we can come up with). My dad and his brothers and sisters and their families (when they can) come in to just hang out and reconnect. Most of the weekend we had about 15 people there, but on Saturday that jumped to around 25ish (I really didn’t count). Let’s just say there were a lot of people. Grand Lake has been a central meeting place for our family since I was a kid. My grandparents retired there, and we would all gather at their house for every holiday (Memorial Day, 4th of July, Easter, Labor Day…you get the idea) and as many weekends as possible every summer. 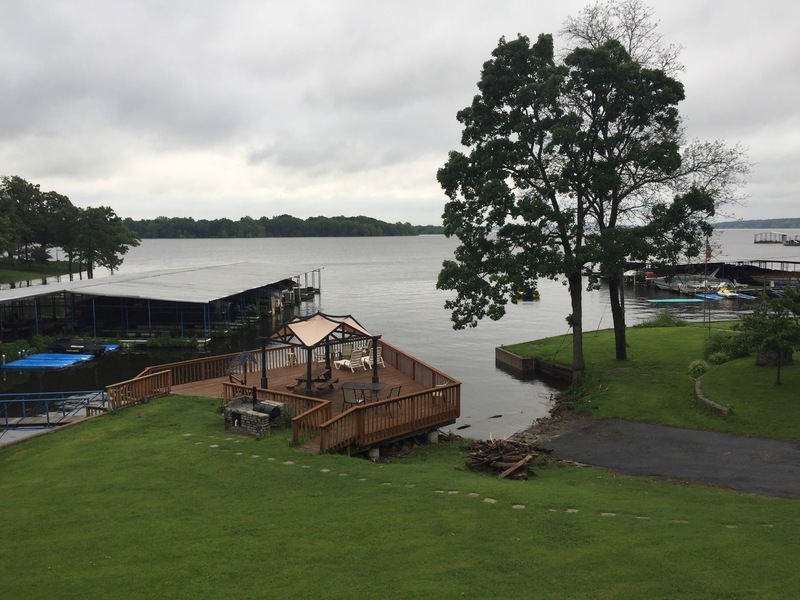 Some of my best memories were built on that lake. I learned how to fish, helped “teach” my cousin to swim, drove a boat for the first time, told stories, enjoyed the fruits of my grandparents’ gardens, learned checkers, became a baseball fan, watched my first soap opera, got my first black eye, and so much more. When we were looking for a gathering place in later years, it seemed only natural to choose Grand Lake. Some of my favorite moments this year included taking my nephew and his friend out on a paddle boat (apparently kids under 14 can’t go alone. My nephew was horrified.) The wind blew so hard the little boat moved backwards, no matter how hard they paddled, and they had to work hard for their trip around the cove. However, there were no (major) crashes with docks, a couple of turtle sightings, a threat was made to eject someone from the boat (and an unsuccessful attempt), and a lot of laughter (also a request to turn in the boat 15 minutes early). Paddle boating is tiring. My cousin’s boyfriend and my uncle attempted to teach us how to play the card game, Pitch. We learned how to play a game, but I’m not sure it was Pitch. They kept remembering rules they’d forgotten as we were playing (they were threatened with their lives discouraged from implementing new rules halfway through the game). However, I think I have it now…maybe…there are a lot of rules. The most important thing to come out of the game was a nickname for our new “teacher”. He now goes by Pickles. (It is funnier if you were there). Also there was singing! My dad only knows one song, and only part of that. Have you ever seen the movie Paint Your Wagon? It is an old western starring Clint Eastwood and Lee Marvin. Until I saw this 1969 film, I had no idea that Eastwood could sing, and although it is Harvey Purcell who sings my dad’s song, They Call the Wind Mariah, it was this unsuspected side of Dirty Harry that stuck with me. If I remember correctly, this was one of the first movies my parents went to when they started dating. The first time I sat through this film, I made my parents promise me that I wouldn’t have to watch it again for 10 years. (I think I was 10.) I did watch the movie again, and really enjoyed it. (What can I say, it’s no Star Wars but it is pretty good.). Now, I’m willing to watch it whenever they want to. I suppose, it is pretty sweet that my dad still sings a song from one of my parents first dates. All of this to say, there really is nothing quite like family. Next year’s lake trip can’t come soon enough. I’m keeping this one short and sweet. I promise, there is more on my trip to Boston to come. For now, I have a couple of fun facts for you. Did you know colonial Bostonians had a horrible sense of direction and/or sucked at map reading? I know, hard for me to believe too, but I have two pieces of evidence to support this. The Battle of Bunker Hill was not fought on Bunker Hill. It was fought on Breeds Hill. They just went to the wrong hill. 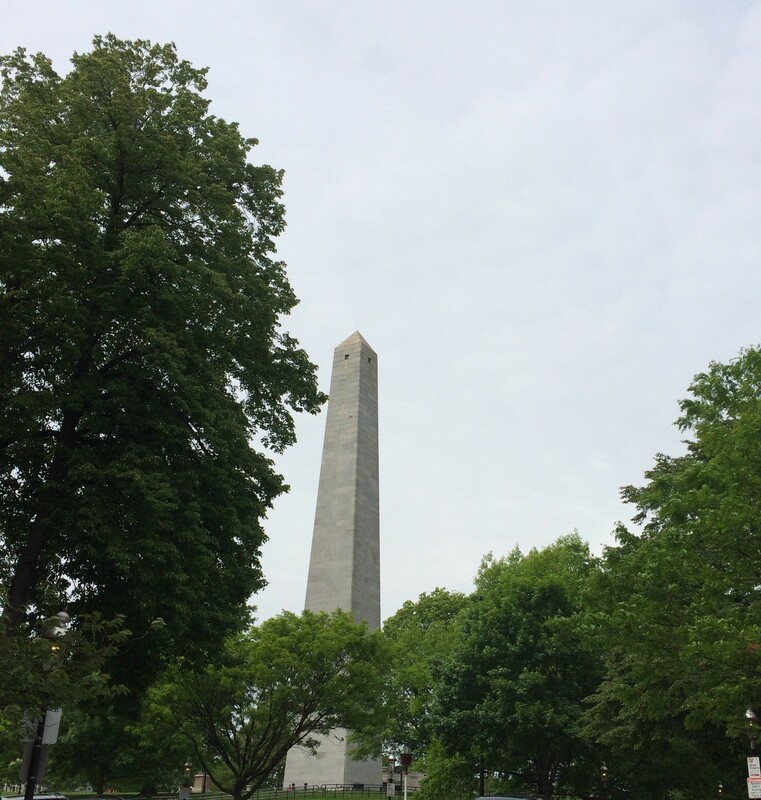 As evidence that history was indeed written by men, the battle is still called the Battle of Bunker Hill, and the Bunker Hill monument rests on Breeds Hill…you know where the battle actually happened. My guess is they just didn’t want to admit they were wrong. 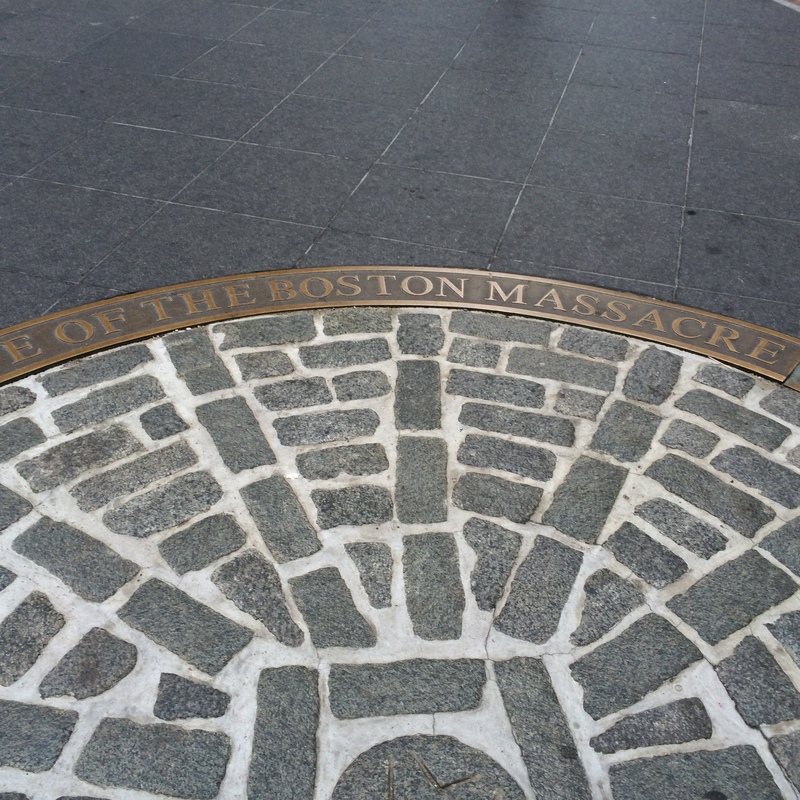 The Boston Massacre Marker in the sidewalk is across the street from where the Boston Massacre actually happened. This may just be because it looked better in front of the Old State House rather than the Bank of America…who knows. All in all this trip makes the Top 10 vacation lists…possibly even the Top 5. It was wicked good.